The official Pride and Trans flags were raised at the same time for the first time ever today to help kick off Pride Month. 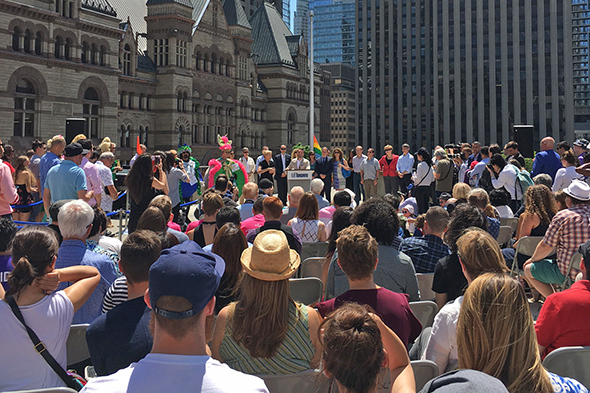 Never have the two flags been raised simultaneously to launch North America's largest Pride event, and never before has there been a Pride Month in Toronto. Who says a week is enough to celebrate Pride? Who cares! Both flags could not be raised on the main flag pole at City Hall because of city protocols, so the Trans flag is flying on Queen Street, next to the fountains. Both Mayor John Tory and Pride Executive Director Mathieu Chantelois highlighted positive developments in the LGBT community with the introduction of Bill C-16 (guaranteeing rights and protection for transgender people under the Canadian Charter of Rights and Freedoms) as well as funding for two LGBT youth shelters. It's also worth mentioning, Rachel Clark, member of the Pride Board of Directors, will be the first trans woman ever to throw the pitch at a Blue Jays game on June 9. It's great that the flags are now up, but things really get started at AGO's First Thursdays party in partnership with Pride and curated by Bruce LaBruce. The parties, talks, film screenings, lectures, art shows, performances and finally, three parades all follow suit. There are over 60 events over the span of 33 days. Brace yourself, and prepare your liver and dancing legs for the tremendous workout to come.